Haha; I got a good one. Sorry, it's actually spelt Ms. Harshwinny. She's an existing character though. 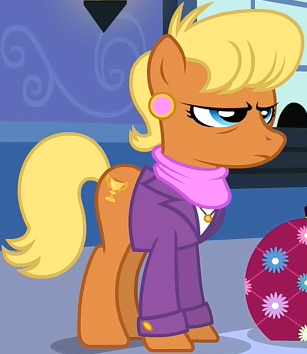 She's an earthy pony from season 3. She's the one in charge of choosing where the Equestria Games will be held. Y'know, the cranky-lookin' pony who shattered Rainbow Dash's dreams back when she was still a little filly, lol.